In this episode of the TiLT Parenting Podcast, I talk with the founder of the popular psychology website Hey Sigmund, Karen Young. Karen created Hey Sigmund because she realized the power of solid information, and wanted to share brain science and the latest research and news about psychology with everyday people. 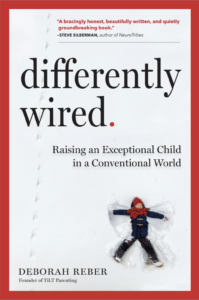 What attracted me to Karen’s website is that it frequently features fascinating, comprehensive, and easy-to-digest articles on issues surrounding kids’ emotional and mental well-being, with a special focus on anxiety in kids. And that’s what we’re talking about in-depth today—anxiety in children. Karen will tell us exactly what it looks like, how we can recognize it in our kids, what to do about it, and how to talk with our kids about it. Karen also tells us about her new book which she wrote specifically for children with anxiety, called Hey Warrior. About Karen: Karen Young has worked as a psychologist in private practice, in organizational settings, lectured and has extensive experience in the facilitation of personal growth groups. Her honors degree in psychology and masters in Gestalt Therapy have come in handy at times. She founded Hey Sigmund after realizing the power of solid information. Her articles have been translated into a number of languages and her work has been published on various international sites including The Good Men Project, The Huffington Post, The Mighty, and Yahoo Health. She is also a regular contributor to Parenting Magazine in New Zealand. She can often be heard on Australian radio, and is and a sought-after speaker. Recently, she published Hey Warrior, a book for kids to help them understand anxiety and find their ‘brave’. Another amazing episode. Thank you Debbie and to Karen for such a clearly explained description of anxiety and how to tackle it. Useful for parents, children and adults with anxiety alike. I’ve forwarded the podcast to several of my friends who will also find this so useful. Thank you so much, Zoe! So glad you got benefit from it.